Bella's Beauty Spot: Triactol Bust Serum.. Does it work? Triactol Bust Serum.. Does it work? When i was 15 years old I fell for a scam, saved up all my money, which was $300 at the time to buy a breast enhancement pill. How silly right? Of course it didnt work, and years went by before I got a check for $5 from the company because they were sued as fraud. So I was a little hesistant to try out Triactol. 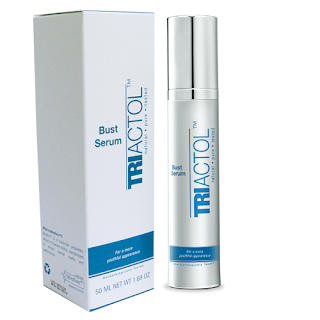 Triactol Bust Serum is completely natural. Triactol is made from Mirofirm™, based on the unique and yet simple philosophy of "natural. pure. proven". It does not contains harsh and toxic chemicals, dangerous parabens, and other harmful preservatives. Triactol Breast Enhancement Serum is free from synthetic hormones. Triactol Breast serum is clinically and dermatologically tested in order to provide safe results. Triactol promise results within 3-6 weeks with a size increase of up to a cup which falls within their refund guarantee. The Triactol cream is completely made up of herb extracts and has no negative effects. It is free of side effects seen with pharmaceutical supplements and surgery. Triactol ingredients are extracted from a unique plant named as pueraria mirifica. This plant is mostly found in Thailand. Women who choose natural breast enhancement as an option see differing degrees of results but most women who try Triactol are very happy with the results they see. " Triactol promises results in a couple weeks but do guarantee if you don't see results you will get your money back. After applying this twice a day for a month, I did start to see results. Not "larger" but "fuller". One month of the product will set you back $128 which might seem like a large amount but is much more affordable then 7K for breast implants. The downfall? After researching I couldn't find out if this product fades away or lasts forever. So I will tell you the product is not a fraud, it definatly works, but I'm not sure how long the results will last you. Triactol is available on their website at https://www.triactol.com/ So if you're interested in enhancing your bust it is worth a try, especially with a 60 day money back guarantee.